Yes, you did read that correctly: Bank holidays are just around the corner. And that means one thing: long weekends. As we're so lucky to live near various short-haul European countries, not to mention blessed with gorgeous beaches and countryside in the UK, there are plenty of destinations you'll be choosing from. You might even opt for a staycation and be a tourist in your own city. This, of course, always leads us to think about what we'd like to wear for these various sojourns. Whether you're off on a city break, a weekend in the Peak District or just a Netflix-and-chill at home, there are capsule wardrobes to know about. 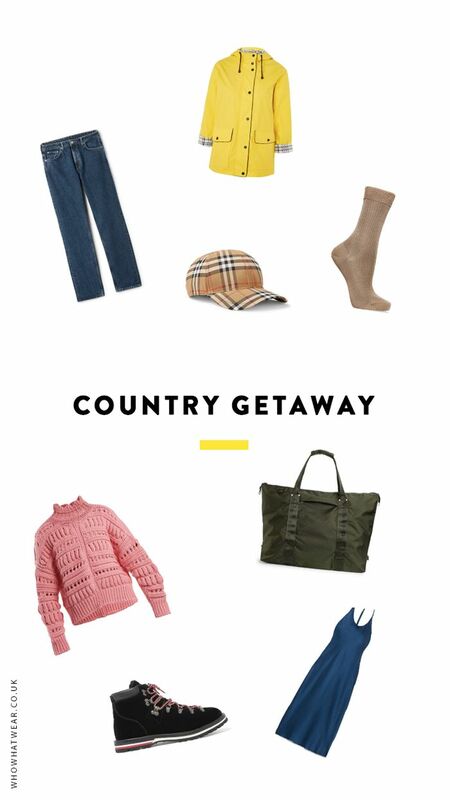 Ready to shop for your next long-weekend break? Keep scrolling for the four mini holidays you'll want to take soon. Style Notes: For a bucolic break, you'll need to think about various weather conditions, so you'll obviously need to pack a waterproof jacket (although a cool one at least). Jeans, a cap and walking boots are a must. But make sure you pack a slip dress for evenings by a fire. Products (clockwise from top left): Topshop Onara Cross Body Bag (£22); Michael Kors Ribbed Cashmere and Linen-Blend Sweater (£1367); Miu Miu Round Sunglasses (£227); Adidas Campus Trainers (£70); Rixo London Georgia Pleated Floral-Print Silk Midi Skirt (£220); Zara Jogging Trousers With Side Stripes (£30); Zara Bomber Jacket With Side Stripes (£30). Style Notes: The staycation requires the comfiest of clothing if you plan on just staying in and watching the latest season of Jessica Jones. Of course, if you'd rather get out and about and go see the local sights, you need a pair of trainers for walking, a jumper and a fun skirt for day-to-evening attire. Products (clockwise from top left): Mango Cord Interwoven Sandals (£60); Sensi Studio Lady Ibiza Toquilla Straw Hat (£180); Topshop Fisherman Crew Neck Jumper (£69); Warehouse Spot Frill Swimsuit (£36); Stella McCartney Falabella Crocodile-Effect Luggage (£1395); H&M Short Dress (£25); Frame Cut-Off Shorts (£200); Linda Farrow Aviator-Style Gold-Tone Mirrored Sunglasses (£790); Arket Crepe Boiler Suit (£135). Style Notes: There is such a thing as the quick beach trip—who says you can't drop in to Andalucía for a few days? Pack a swimsuit, hat, shorts and sandals to keep you going in the day, and then a jumpsuit and a dress for the evening. Simple. Style Notes: The Euro-city trip requires a bit of thought, considering you might encounter rain. Bring a trench coat to ward off any bad weather, but know that it's smart enough to wear when you head to any restaurants. A skirt, T-shirt, sunnies and a cap will keep you going during the day, but throw a smart jumper on top and you'll look ready for the evening. What are you waiting for? Time to book your trip.